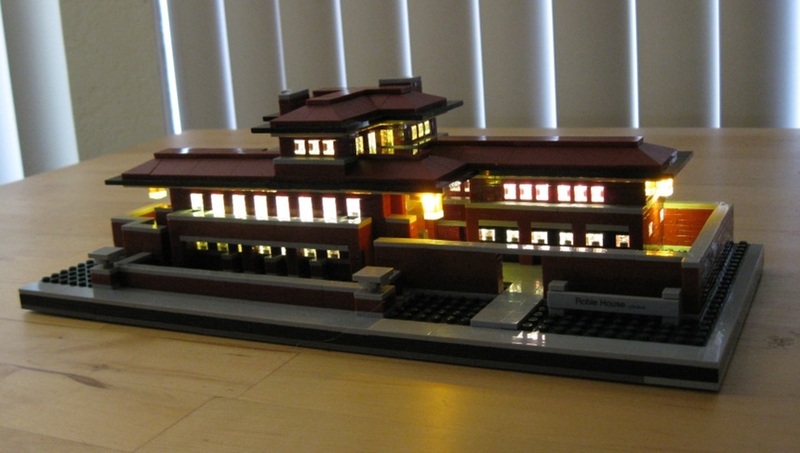 The beautiful Lego Architecture model of Frank Lloyd Wright’s Robie House was released in 2011. Adam Reed Tucker designed this faithful reproduction of the iconic Chicago landmark. Late to the party as usual, I decided to build and light the LOZ copy from China. 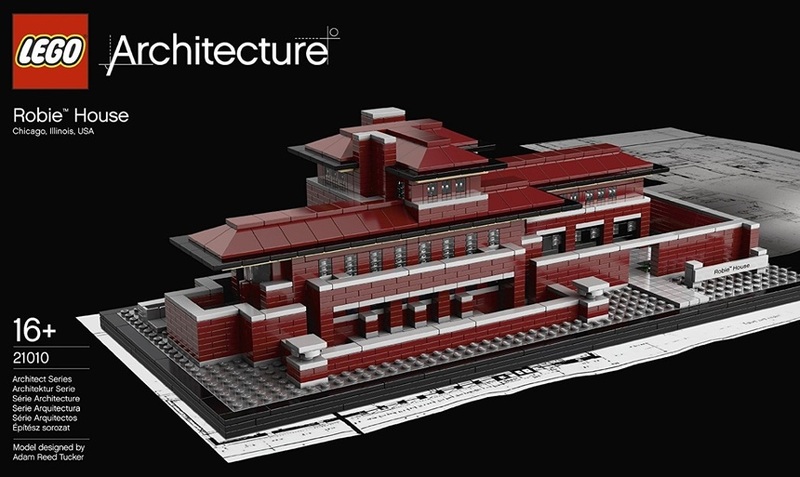 The original Lego Architecture version is fetching very high prices on EBAY. As with their Imperial Hotel, the LOZ folks have shrunken the model down using their two-thirds sized bricks. The original Lego Architecture model measures 16.5” wide, 7.5” deep, and 4.5” high and consists of 2276 bricks. The LOZ clone measures 12” wide, 5.75” deep, and 3.5” high and contains 2115 bricks. 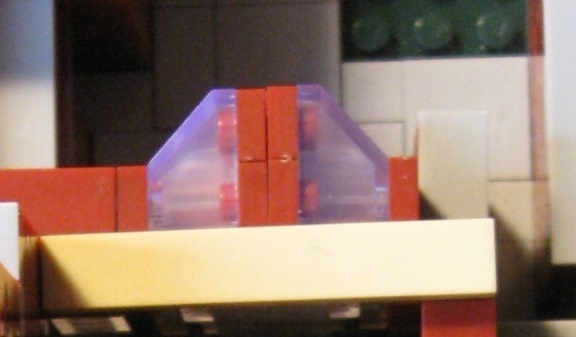 The colors of the LOZ bricks—particularly the gorgeous deep red—seem fairly true to the original Lego colors. The reason for the 250+ difference in the total number of pieces is entirely due to fewer 1x1 gray tiles and more larger gray tiles being used in the LOZ version for walkways and sidewalks and such. 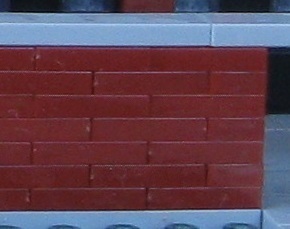 Both models contain very large numbers of small (1x1 and 1x2) red plates to simulate the red bricks of the Robie House. Having only a limited stock of spare LOZ bricks in this special smaller size, I had to keep any changes to a minimum. I wanted to increase the size of the grassy areas and had sufficient large green plates to accomplish this. The areas of walkways in gray tiles were extended to the edges of the base. The most important bricks were transparent and transparent tinted bricks to unblock windows and doors to enable light to get out. The solid bricks behind the front windows were replaced with stacks of 1x2 transparent black bricks. 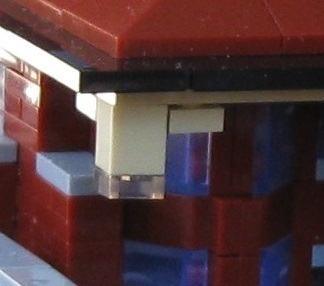 Clear bricks replaced solid bricks inside the triangular end window assemblies. 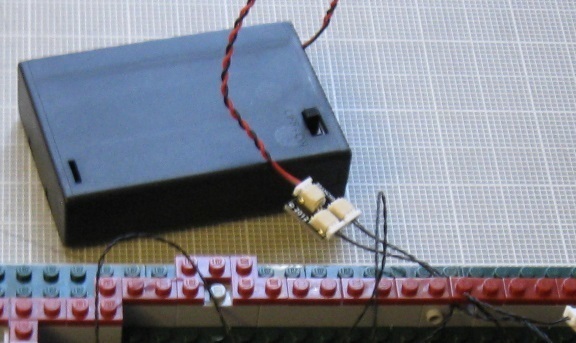 A brick was left out of the rear wall to allow cables inside from the battery box and adapter outside. The Robie House has lots of windows on all four sides, on interior walls and in the upper floor. I ended up using five Pico LED lights, two LED light strips, a battery pack, sticky squares and several adapters and extension cables. 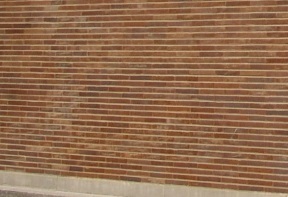 The light strips were stuck onto raised brick platforms in the center and right side of the building. 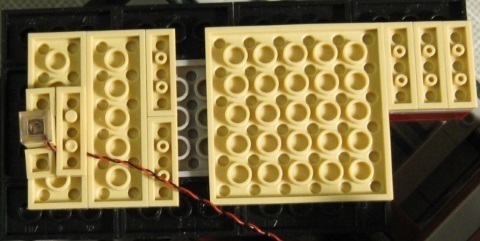 One Pico LED fed from the connector at the end of the center light strip to the left side of the building via an adapter and was stuck onto a stack of bricks. Another Pico LED fed upwards from the adapter inside the rear wall up into the boxy upper story. A gap in the brick floor of the upper story allowed the wire to enter. This Pico was placed on a small stack of bricks. The beauty of the design of the overhanging roofs and the enclosed pathways and gardens inspired me to add three more lights not in the original building. I constructed three little hanging lights out of 1x1 colored and clear square bricks and fed Pico lights into them to light the front, center right and left overhangs. I attached these three assemblies under the three overhanging roofs. I may have gone too far with this, but I liked the the way the yellowish light from these overhanging lights mixed with the white light coming from inside the building. I also amused myself by adding several small tables and chairs to the interior gardens. Here is a photograph of the final lighted model. You can view the rest my Google Photos gallery here. As with your Imperial Hotel, this lighting job is first rate! Thanks, Jim. Kind of you to say so. 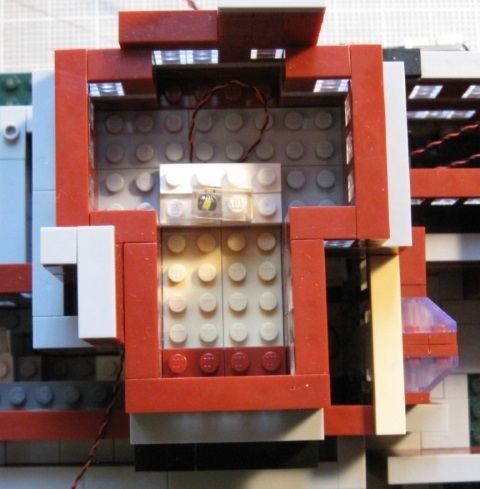 I have not done a write-up but have lit the Lego Villa Savoye here on a bigger green base, without any roof studs, with roof plants made from Nanoblocks and with two MOC trees from an Australian Lego designer. I also did the LOZ version of the Farnsworth House here. Thanks as always David for your great work and write-ups! 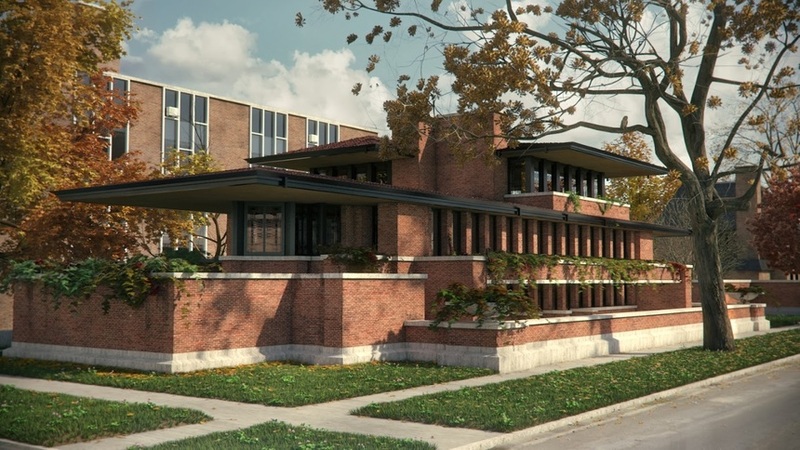 Here's a fun fact about the Robie House: I actually used to work in that building. In the '90s I worked for the University of Chicago and the building was used as one of their Alumni Association offices. This is before the large-scale renovations that came later in the decade-- now I'm sure they wouldn't dream of letting office-types in there. :-) It is such a beautiful building. I ordered the Loz version but I also bought the Robie instructions and was hoping I could use the bricks in the Loz kiss and add to them to build the one Lego designed is this possible? Aaron Bennett I don't quite understand your question, Aaron. You ordered the LOZ version which, of course, comes with the LOZ instructions. 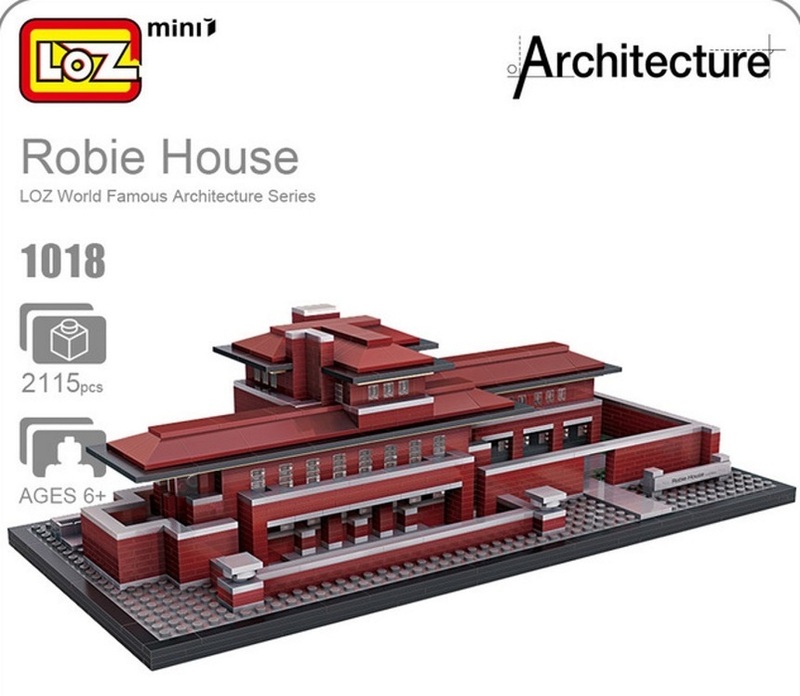 Then you bought, separately, the Lego instructions for their Robie House? The LOZ bricks and the Lego bricks are completely incompatible. 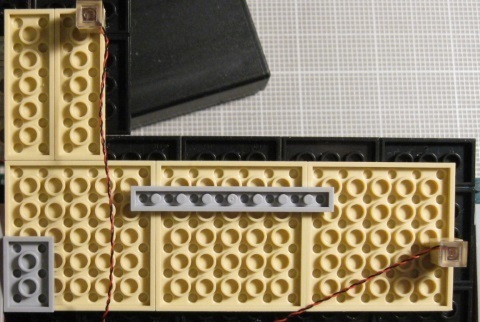 All LOZ bricks are two-thirds the size of the Lego bricks. They do not fit together. I don't really understand why you felt the need to buy the Lego Robie instructions since you can't mix the bricks together. As you can see from my notes above, the results are similar with the two versions. The final Robie version is two-thirds smaller. LOZ also uses a different technique to build the gray walkways and sidewalks. Please let me know if I'm misunderstanding your question. I had no idea they would be different size I build mega blocks stuff all the time I have almost every vehicle like a grand worth of it and they are totally compatible so I assumed the Chinese knockoff would be the same size as well I messed up I plan on buying all the bricks than for the Robie house.